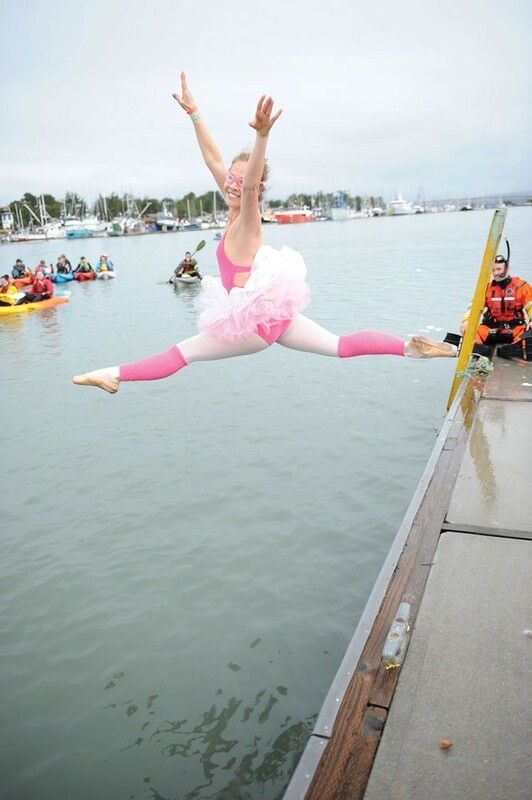 Every year, in the heart of winter, hundreds of "perfectly normal people" take a running leap off a short pier straight into the Humboldt Bay. It's a cold, wet and sometimes stinky endeavor. So why? Well, there's the Bloody Mary and hot tub soak after, plus free lunch and T-shirt to take home for those who jump and, let's face it, some people just like to make a big splash. But we know what motivates most are the thousands of local youth that benefit from the Perilous Plunge, Redwood Discovery Museum's annual fundraiser, happening Saturday, Feb. 11 from 10 a.m. to noon in Old Town, Eureka (free to watch). Now in its 16th year, the event draws crowds of fans, including the friends and families of costumed plungers who've pledged donations. Their support helps fund the children's museum that offers interactive exhibits and hands-on activities where curious kids dabble in science, art, culture, technology and healthy living. The plunge is preceded by a parade (the costumes in and of themselves are an event you don't want to miss) commencing at the Clarke Parklet at 10 a.m. and heading to the foot of F Street for the plunge at 10:15 a.m.